It can be comforting to celebrate and remember the life of a loved one after they’ve passed away by making a gift in their memory. 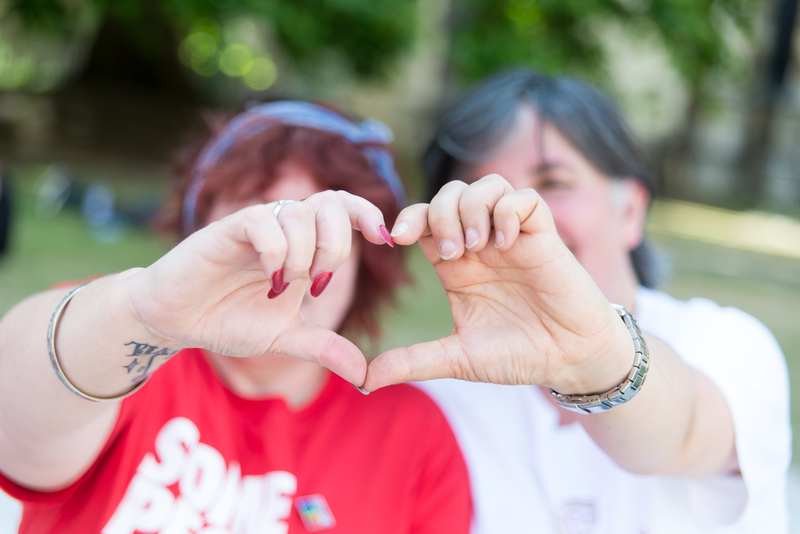 Every donation in memory of a loved one, no matter how big or small is a lasting tribute and helps us make the world a safer place for all LGBT people. You’re not alone in making a memorial gift to Stonewall. Many family members and friends make a donation as a way to celebrate their loved ones’ lives and commitment to LGBT equality. "Both my late wife Rachel and I have been and feel very fortunate to have family, friends and workplaces that have given us the respect that everyone has the right to irrespective of their sexuality. During Rachel's short 42 years of life, she wholeheartedly believed in supporting Stonewall to help others receive this respect and happiness in their lives. She was a 'Close Friend', regularly donating every month to Stonewall for many years. So when she died it was a no brainer to put forward the charity for donations in place of flowers. Over the course of our lives, Rachel and I have seen the progress that Stonewall has made for all LGBT people in this country but we also still hear about the young suicides, the homophobic beatings and the continuing difficulties that transgender people face, so there is still much to do. That’s why I continue to be a 'Friend' of Stonewall. I need to do my bit." There are a few different ways of collecting and donating to us, depending on what is best for you. Many people ask for donations instead of flowers at a funeral or memorial service. 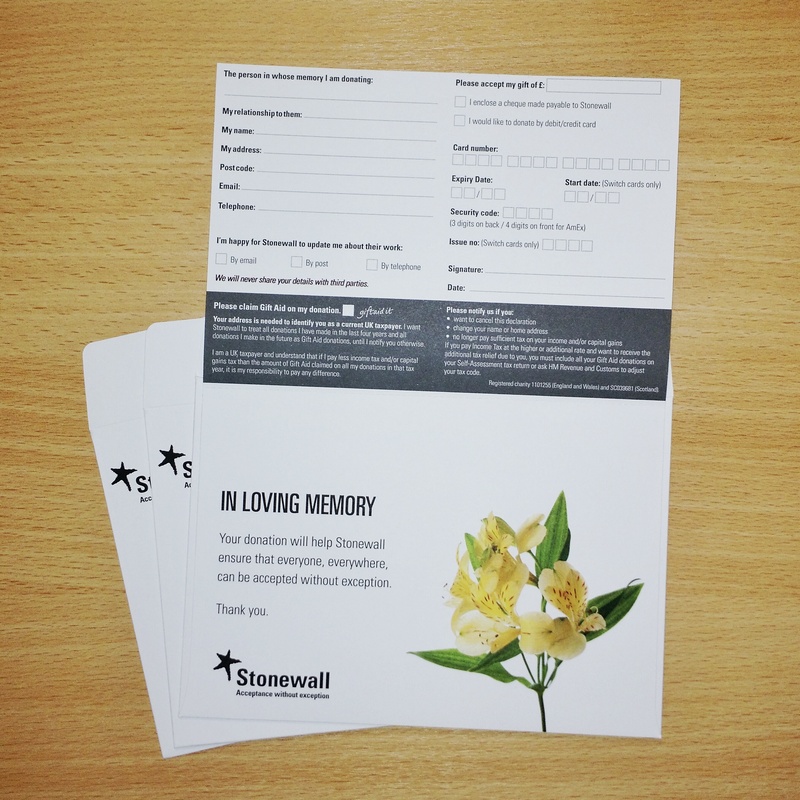 To ask for our special in memoriam freepost envelopes, which will help you collect both card and cash donations, please email supporter.care@stonewall.org.uk or call us on 020 7593 2291. 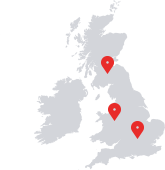 We understand that organising a service is a stressful time, so once we receive your request we’ll send these to you the same day if requested before 4pm. When we have received your returned envelopes, we will always send you a letter of acknowledgement and a total of all the funds donated. 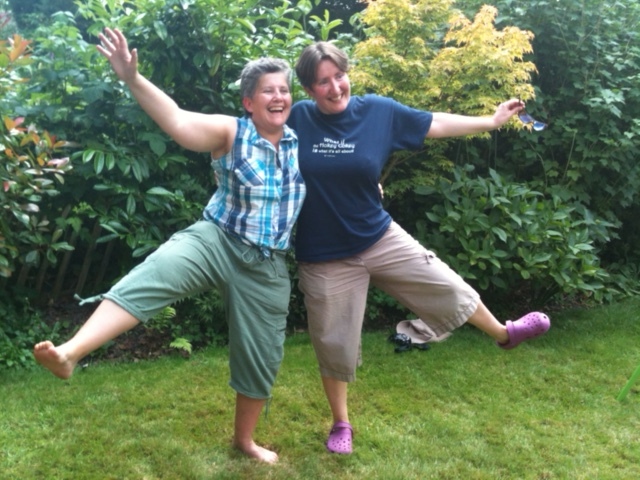 Stonewall also accepts donations through the fundraising platform JustGiving. You can automatically link any fundraising pages you create to an online tribute, and the page will be open to collect donations and new messages for as long as you like. For more information on how to set up a memorial JustGiving page, please see this guide. You are always able to make a donation through our website, as well as setting up a monthly donation, which ensures that our work is continually supported. If you do choose this option, please select ‘In memorial’ from the menu. We can also take cheques payable to ‘Stonewall Equality Ltd’, card payments by phone and also bank transfers. To discuss ways of donating to Stonewall, please call 020 7593 2291.